I was told Chicago was famous for deep dish pizza. I was reminded a few times to go try it. "A MUST TRY!" she said. Even went as far as to prepare a map with the restaurant marked in a big red X for me. 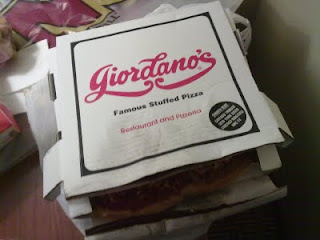 So I took a train to Chicago one Saturday, asked around for the location of the famous Giordano's and waited 35 minutes (dat's rite thirty-five minutes) for 1 personal stuffed pizza. 1 stuffed pizza arrived, cut into 6 humongous slices, each slice as thick as the width of 3 fingers put together. I only managed 1 slice. When I asked for the bill and a box, the waiter was shocked by the leftovers. "ONLY 1 SLICE??!" I smiled an embarrassed smile and mumbled that I had a train to catch. In truth, I was so full and even that first slice was hard work! Plus it wasn't as good as I thought it would be after all the praises she sang about it. hey, i juz saw this! hehe. thanks. but would be better if u could have somehow tapau-ed the pizza back for me! lol. lol cannot tapao back la..i think custom sure stopped me! haha this post is jst to tease u nia la..at least i'd tried and seen it, rite? the americans wont care that u're bringin pizza out of the country, and malaysian airport, i think even if u bring a gun on you, it wont set off the metal detector! 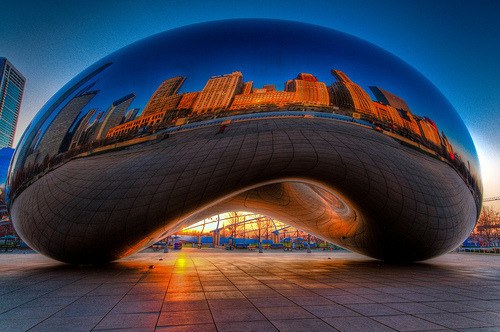 erm........ but u can understand how it'd be a shame to go to chicago n come back without seeing the cloud gate? its like going to paris and not seeing the eiffel tower, eventho the tower really aint that interesting. or is it? i havent been. lol. actually what i like most about it is the whole thing... it must be taken as a whole to be fully appreciate, i feel anyway. because its a different art form from different angles. every inch of it bents n reflects images differently. the most interesting point is its center point on the inside, right underneath. after you go underneath, then step back and look at the whole, it is such a simple yet awe-inspiring work of art. made possible only because it was perfectly crafted too.